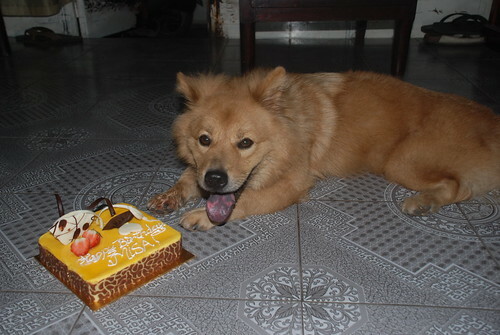 I've had my dog for five years and for the first time since 2005, I decided to have a small celebration for my king, Misa. We cooked some roasted chicken, steamed some corn and made some salad and said cheers for misa with some wine, Russian beers and Belgium beers plus a birthday cake for dessert. I made a small slideshow to show my friends of Misa's life from the first day up to now. It was fun and my friends loved the photos very much. 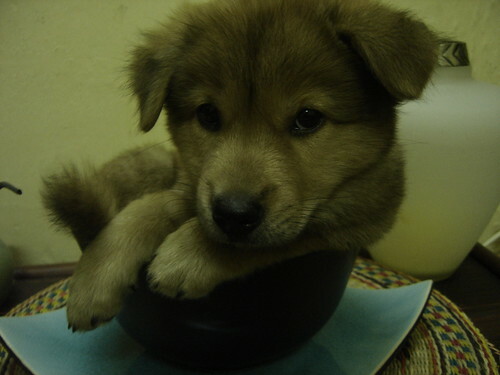 You have to admit, Misa is pretty cute. We usually take Misa on our trips so that he has been to quite a few places around Vietnam, including Quan Lan island, Tam Dao, Nha Trang and Hoi An... He loves going on the motorbike and in taxis. He's even been on Vietnam Airlines! 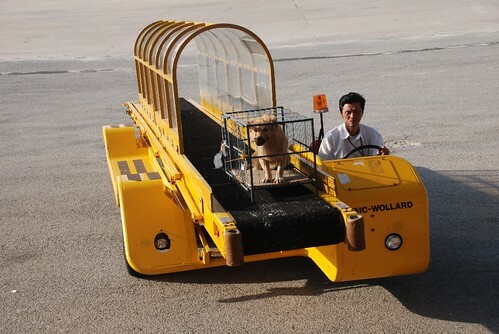 He is a very good dog who obeys my commands very well because we trained him well but he only understands English. My friends also love Misa very much. He loves having a shower very much, standing up on the side of the bathtub to let me shower him. 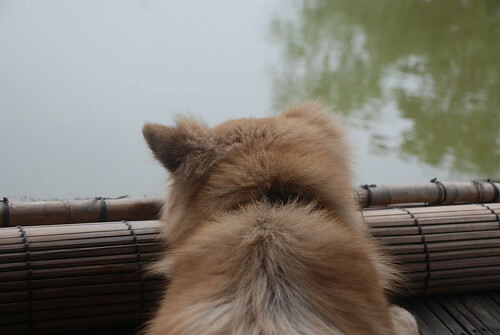 A special thing about him is that he doesn't really like to eat dog biscuits but he loves eating rice from Com Binh dan restaurants and duck eggs. When we used to live in Cao Ba Quat street, I usually took him to Lenin Park which was close by for him to play. Since we moved to Nghi Tam, he loves going to the Thang Loi Hotel to run up and down the grass hill then we walk back home. 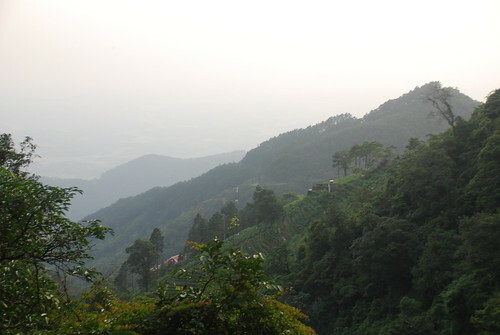 A week ago, I took a short trip with my friends to Tam Dao, a hill station about 90 km from Hanoi. 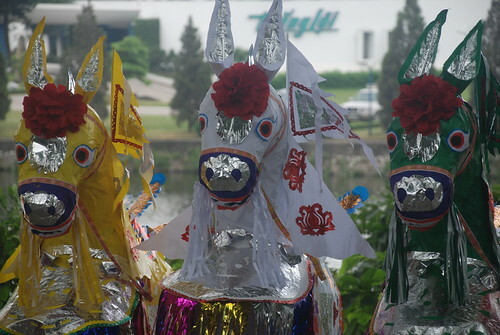 Like so many Hanoians, they have recently bought a car and, according to Vietnamese custom, whenever you buy something new, you have to celebrate with friends. It also meant we could escape from the horrible heat of last week. 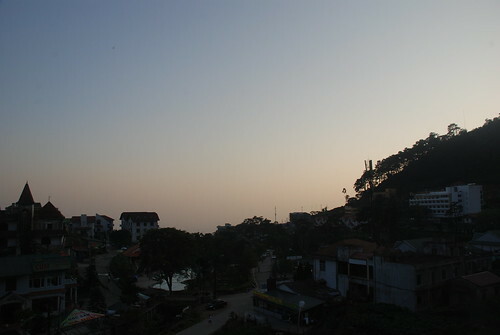 During the week is the best time to go to Tam Dao as it's very quiet compared to weekends. It seemed there was only us and about 10 other tourists also from Hanoi. I have been to Tam Dao several times during the past 8 years and it never seems to change much but there do appear to be more guest houses. The last few times I've usually stayed in a small guest house on the top street of Tam Dao, but I changed my mind this time to stay near the market which is close to the main street where the restaurants and shops are located. 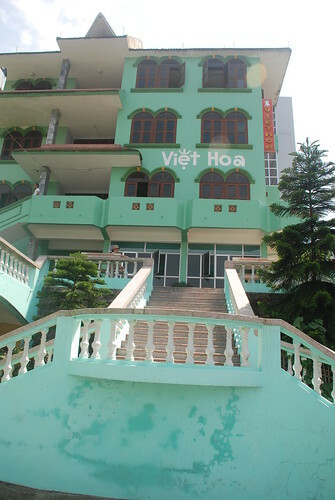 After checking out a few different guest houses, we picked Mai Hoa guest house which only coat a cost of only 100,000Vnd per night. The hotel was very clean, the proprietor and staff were friendly and they served great food. The only thing that they didn't have was airconditioning but in Tam Dao it's hardly necessary as it's always cool and a bit chilly in the evenings. In fact, I needed to use the colorful blanket provided to keep me warm. We had lunch at the hotel the first day, which of course included the local specialty vegetable, Susu. 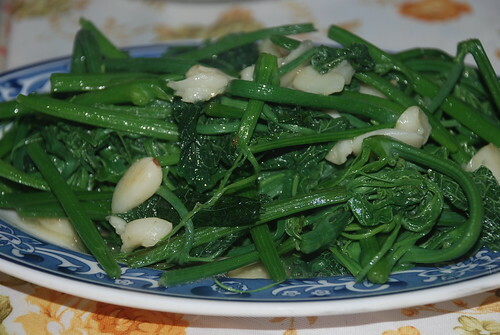 I ate so much of this vegetable during my trip there along with wild boar and wild chicken. For our second meal, we went out for dinner to a restaurant near the hotel but like so many restaurants in these kinds of semi-remote tourist destinations, it was very expensive. I hate it when they just make up the price. As a consequence, we decided to eat at the hotel for the rest of the trip and the good thing was they served us at our balcony on the second floor with a very nice view of Tam Dao. On the last day, we went to visit a temple called Tay Thien Quoc Mau, which is reached by climbing up about over 100 steps to the top of the hill. The Tam Dao people are investing to make it bigger and now it's almost finished, and includes many statues. I wondered how they could transport all the huge Buddha statues up the hill as it was very steep and hard to climb. Anyway, we spent about 30 minutes there praying, taking photos before going the same distance down the hill to see the Thac Bac waterfall, which my friends hadn't seen before. I felt exhausted on the way back up even though I exercise very regularly. We stopped quite a few times in between to relax and take some photos of the surrounding countryside. Sweating when we reached the township, we decided to take a dip in one of the other hotel's swimming pools. Buy, that felt good. Finally, after two nights, it was time to get back to reality, back to Hanoi to face the heat and work. I really didn't want to leave as Tam Dao's so peaceful. I need to go back here in the near future. Thanks to all of my friends for the fun times. 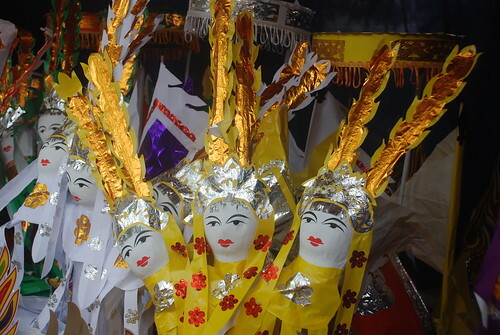 Many Hanoians went to other cities or to the beach for their Independence Day and May Day Holidays. I not keen on that as wherever you choose to go on these national holidays is generally very crowded and really expensive. 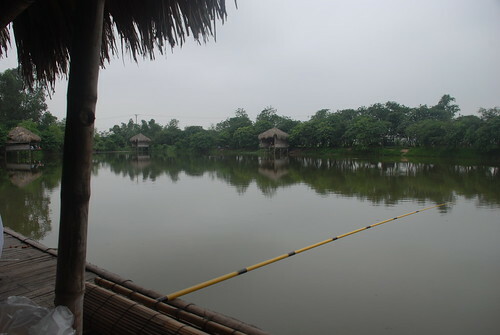 So instead,my ex-colleages and I went to Thang Long retreat in Gia Lam for a day. 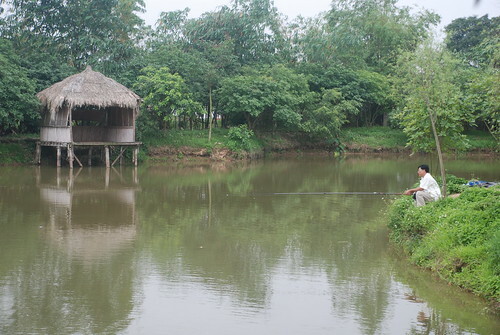 This retreat is such a peaceful place with small bungalows located around a lake from where you can fish. When we arrived, we had the place to ourselves but 2 hours later, the crowds we were trying to avoid showed up. Some were turned away because the place was full. I really appreciated the fact that my friends had booked and ordered from the menu a few days in advance. I've tried fishing before but I wasn't patient enough to catch any fish. My friends didn't seem to be very interested either so we played cards and drank a few beers, and had a wander about to see if anyone else was having any luck with the fishing. It really didn't seem as if anyone was concerned about it. 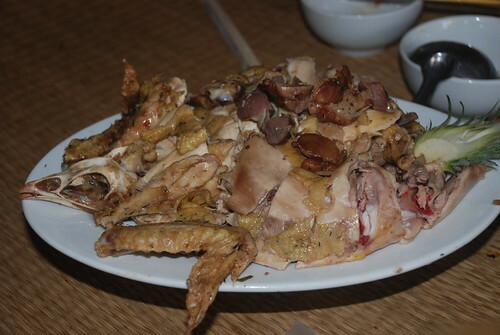 Soon after noon our lunch arrived, many different dishes that my friends had pre-ordered, including grilled squid, chicken baked in mud and beef in vinegar.But the highlight of the meal was the 1.5kg deep fried snake head fish to roll with fresh vegetables. I felt bad as we couldn't finish this super fish dish even though we gave it our best shot. Anyway, the important thing was the relaxing atmosphere on the national holiday. For 8 of us, we only paid 900,000Vnd which means $47 including beers and soft drinks. I am sure I will come back to this place for a future party. Thanks to my friends for a great day. 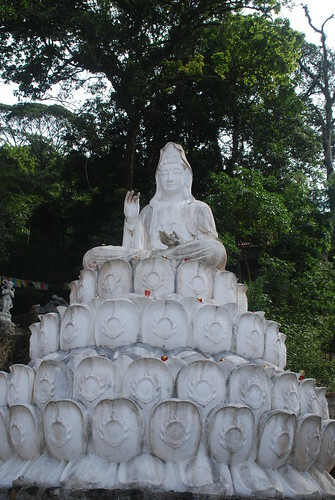 In Asia, people believe in the laws of karma and that's why many people go to pagodas every first day, 15th and the last day of the lunar month to pray for their health and luck... also for their family members who have passed away. The thinking is that dead people also need the same stuff as living people so, on these special days, some people spend millions of dong on fake paper products, from a pair of shoes to air conditioners, even motobikes. But in certain cases and for people in high positions in society, there may be different ways to celebrate. Families who have very successful businesses are known to spend a fortune paying a service to organise the praying and provide the paper goods. 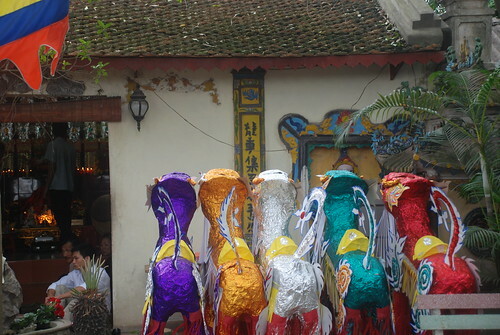 Last week, on the way down to the old quarter, I saw people transporting their stuff on a small truck to the temple to burn after their prayer session and it included lots of huge paper horses, elephants, angels and fake money. This is not the first time I've seen these stuff which is mostly seen during pagoda festivals which are held early in the year. 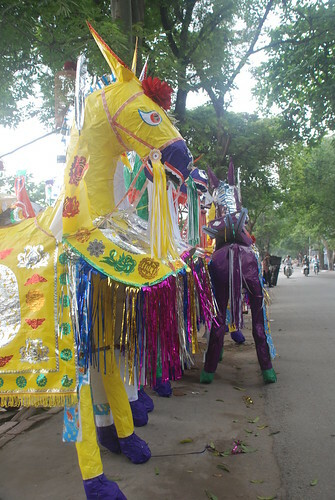 This occasion in Yen Phu street was a private one as it was nowhere near a special lunar day. Anyway, even though it looks good and provides a great photo opportunity, I think this practice is such a waste of money and the smoke produced by the fire is an environmental nightmare, especially on lunar days when everyone in town is burning paper. Last month we went to Siem Reap, Cambodia and following a recommendation from a friend, we stayed at the Golden Banana Hotel. I was very impressed with the hotel in general and particularly the service and friendly atmosphere created by their staff. 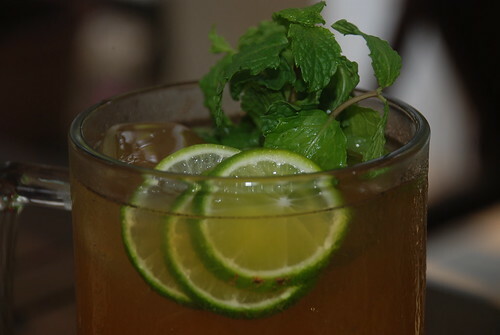 We are welcomed with a glass of iced lemon juice with mint and a cold towel to cool us down as the weather was 35c+ degrees. What a great way to welcome guests...we realy appreciated that drink at that time! After that, the receptionist explained to us about how the hotel operates, the city and some of the best destinations to go for the next few days, then he sent us to our room. 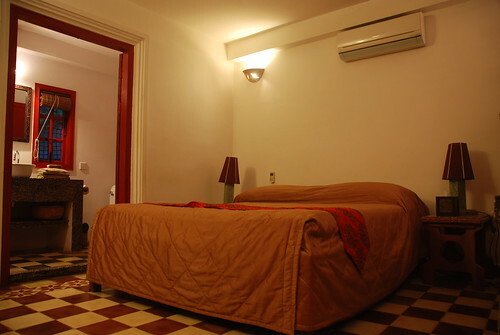 Most rooms in the hotel are similarly designed with a bed room, bathroom on the ground floor and a living room with an extra bed on the second floor. There's a balcony with a rocking chair, small table, another chair and a view over the swimming pool. I wondered if I needed all of this for my holiday? Was it a bit too much for me? And reconsidering, that's what most people need for their holiday, to relax and release all the stress. I decided it was okay! Our room was tidied up everyday and new complimentary water placed in the bathroom. 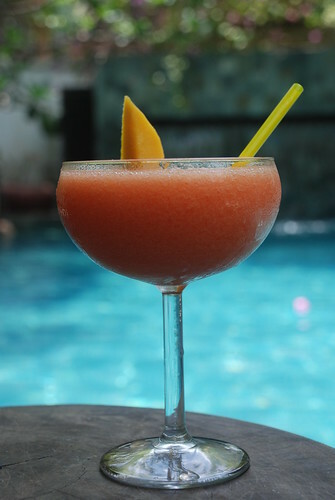 Having a cocktail or a cold beer by the side of the pool was how we spent our afternoons after wondering through temples all morning. The Golden Banana Hotel serves great cocktails even in my limited experience. Their mojito was a hit with me. 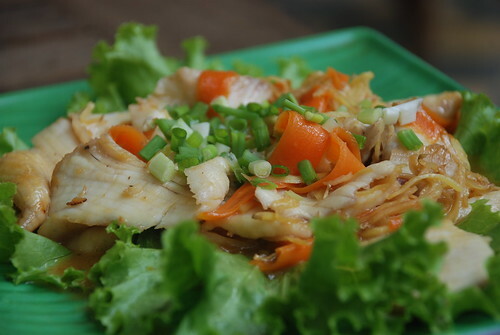 Besides that, I loved the hotel food with great tastes of Kh'mer and some fusion of Thai, Cambodian. Yesterday, it was raining and I was checking my emails. I heard a very deep voice from an old man riding past my door on his bicycle. I finally recognised the call of the handy man who sharpens knives. I've frequently seen him riding by along with lots of other people riding bicycles who shine shoes, collect recyclable waste and even collect kitchen slosh to feed pigs. I called him back to my door and asked him to sharpen some knives. He was a funny man and he did a great job. But in the end he was a bit cheeky asking for more money even though we made the deal at the beginning. Anyway, I think most people doing these jobs don't earn lots of money and I usually give some extra. As he sharpened, he told me he's from the countryside just out of Hanoi and he leaves his home early in the morning, rides around west lake looking for customers and finishes the day at about 6pm. 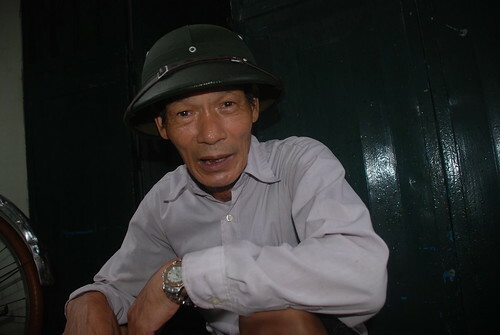 His average income for a day is about 70,000Vnd which is not so bad, considering it takes only 5 minutes to finish a knife. I paid 30,000Vnd for 4 knives and it took him less than 15 minutes work. 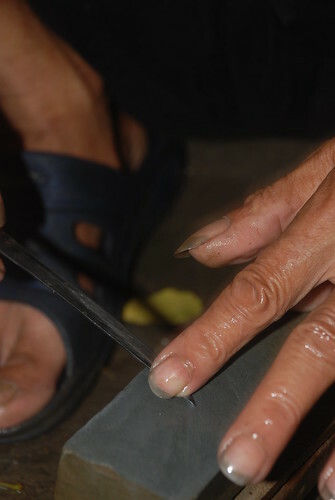 Unfortunately for him, though, most Vietnamese families have their own whetstones to sharpen their own knives. Most people I know who've been to Angkor Wat mentioned the amazing sunrise there so I decided to make the early trip on my first day. We made an arrangement with the tuk tuk guy to pick us up at 5 AM and he showed up on time but we had a problem with the alarm settings. Anyway, after 20 minutes driving including a quick stop at the ticket centre for our passes, we finally arrived at majestic Angkor Wat. There were lots of people already there taking photos and I also saw quite a few people leaving, meaning they must have been there since 4.30 or 5, which is a bit too early for me. I am a bit lazy when I am on holiday, sleeping and eating alot and visiting the sights a bit in between. I don't like the idea of rushing around to see everything possible and then feeling exhausted at the end of the day. I would like to take it easy, relax and enjoy every moment of the trip. 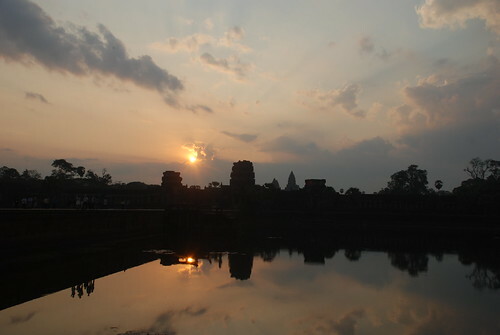 Anyway, we spent about 20 minutes watching the sunrise and taking lots of shots, before walking inside the beautiful temples of Angkor Wat. As soon as the sun came out, the amazing detail of the scenery appeared. Inside the temple gate, we got our first view of the main temple and the two libraries located in the forground on either side. 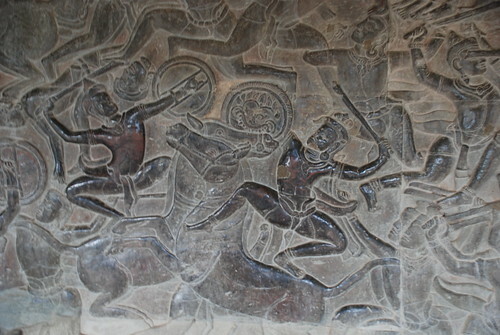 Upon stepping into the main temple, we saw the long exterior walls covered with 600 metres of detailed bas-reliefs with lots of different stories about Angkor's amazing history. 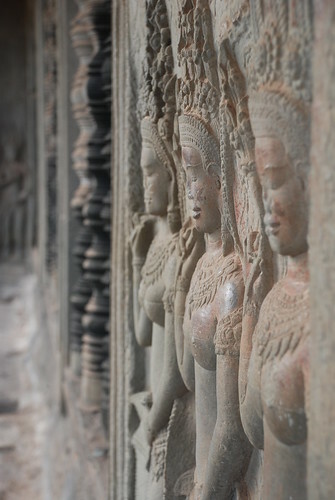 We kept walking around and ended up climbing the steep steps into the main part of the temple, from where we had a beautiful view.The other feature of Angkor Wat is all of the carvings of apsaras, the female spirit of the wind and clouds in Hindu myth. They are everywhere, more than 2000 of them. It was one of the most memorable mornings of my life. Just a quick note and hope everyone has a great week!!! 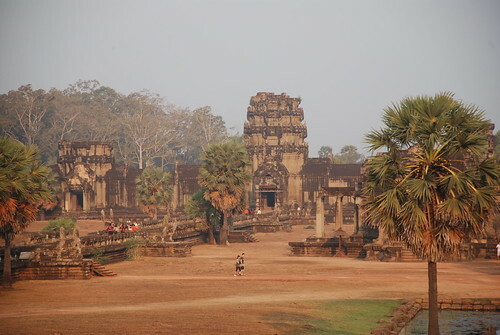 Most of my friends have been to Cambodia and have been talking about Siem Reap for years. 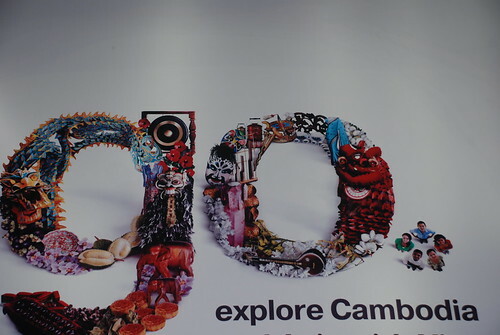 I suppose I've always thought Cambodia is so close and I can make a short trip anytime. I finally got the chance when recently I saw a great promotion from Vietnam Airlines for only $143 for a return direct flight from Hanoi. I can't imagine abetter deal than that. 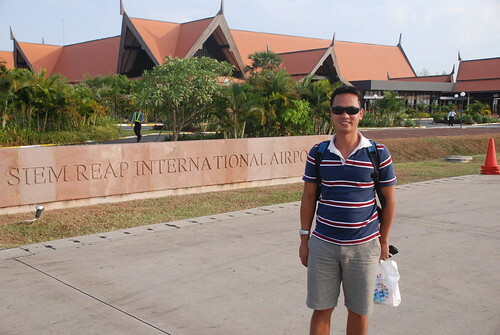 So last week, after a 2 hour flight from Hanoi, I arrived at Siem Reap at 5.30 pm. The Airport is a small but stylish building and we had no problems getting through immigation and customs. Visas for Vietnamese are not required but for other foreigners they cost US$20 and are available at the embassy in Hanoi or upon arrival. My friend had arranged accommodation and we were greeted at the airport by the smiling tuk-tuk driver from the Golden Banana Boutique Hotel. 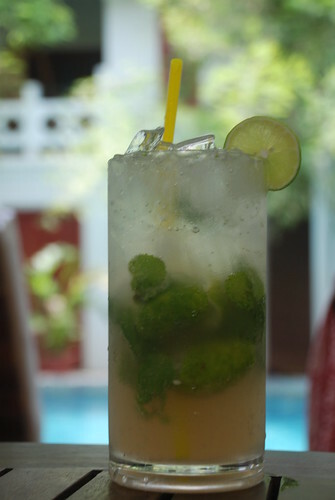 After 20 minutes in the tuk tuk, we arrived at the hotel to be served with a glass of iced lemon juice with mint, similar to my favorite cocktail, Mojito. We checked into our 2 storey room, in the corner of the complex which looks over the swimming pool from a small balcony connected to the living room on the second floor, perfect!!! After unpacking, we ordered from the poolside bar before relaxing in and around the pool for an hour or so. 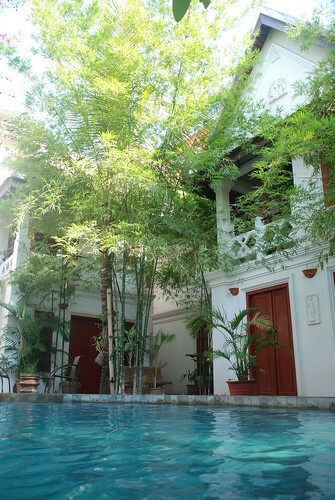 The hotel is only a 5 minute walk to the old market area of Siem Reap where most of the bars, restaurants are located. I have to say, this is one of the best hotels I've ever stayed at with a very friendly, homely atmosphere and helpful staff. It's quiet, tastefully designed and worth coming back to. 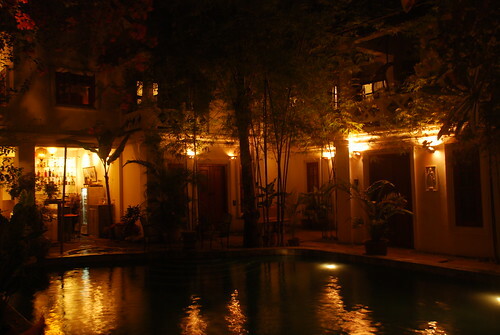 When I'm in Siem Reap next time, I'll be staying here, that's for sure! I love being at the night flower market in Quang An as it's like another small world. I can just sit there looking at young couples hand in hand looking at flowers or people shopping for their retail florists with torches checking out the quality of the flowers. 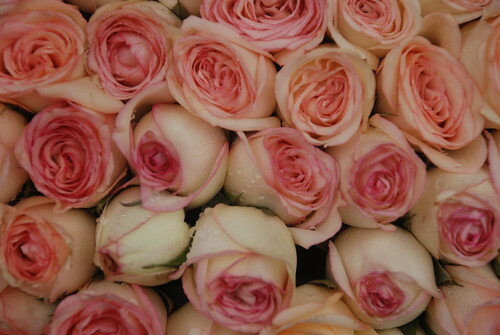 The bargaining also amazes me: recently I saw a person pay $1 for a 100 roses. I do love bargaining not beause I'm stingy but I love playing the game with them and I usually give them a little bit more at the end and see their big smiles. That makes my day. 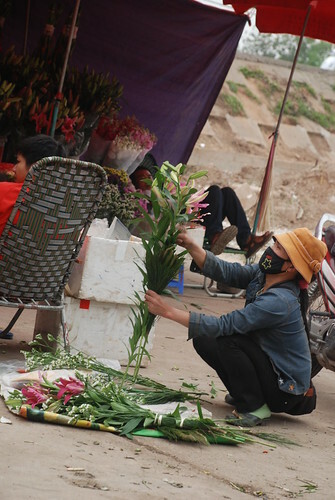 The many street vendors who come to this market to get flowers then spend another few hours to re organize them before selling them along Hanoi's streets. Watching them is also a highlight as I can see they use their talents to make some ruined flowers look beautiful. They take all the bad leaves and petals off and put plastic or paper around the remaining bud or flower pretending that it's great. They do look good until the paper's been taken off. It's a cheeky practice and I've been caught myself. I've learned my lesson though. Besides heavy rain which can put a temporary stop to their business in our area, there is another reason that will stop their business. Whenever a dignitary like the president of the US comes to Hanoi they normally stay at the Intercontinental or the Sheraton hotel, which means most commercial street activity has to stop until the visit is over. In fact, when Bush visited a couple of years ago, there was a tank positioned near where the florists normally trade. Recently during the ASEAN conference, the flower vendors went missing for a few days. 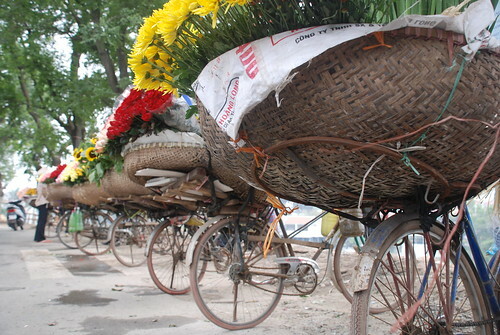 Of all the street vendors, I hope these street florists remain as long as possible as they add a touch of colour and charm to Hanoi.